MSI to EXE Creator software enables user to generate standard .exe file from existing .msi file formats. Setup builder tool ensures to build .EXE file by selecting .MSI file path folder. Software automatically creates .exe file from the selected .msi file and saves converted file at safe location. Exe setup generator utility generates .exe files from .msi files in such a way that no data loss occurred in the process of conversion. Setup maker software provides facility to make complete setup installation package (.exe) without making any changes in original functionality and features of existing (.msi) setup files. MSI to EXE setup maker shareware program provides an interactive graphical user interface to application programmer, developer, coders and other users who can easily access .msi files with .exe file format. 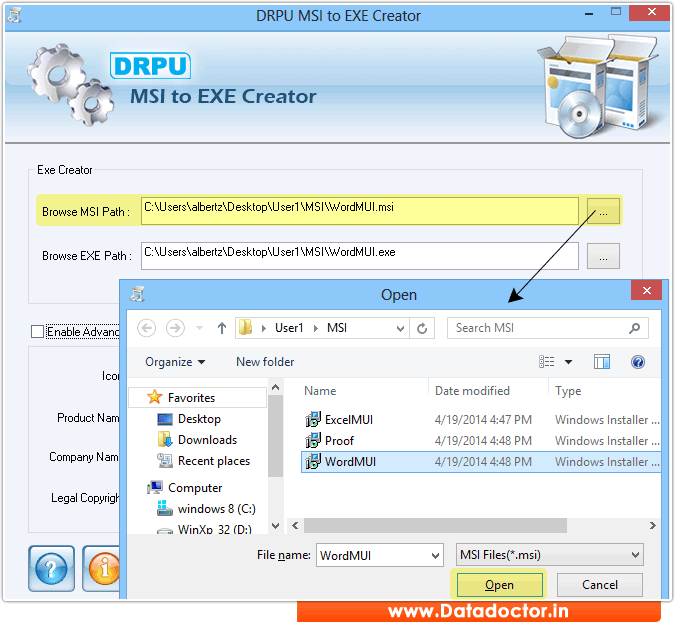 » Setup generator tool generates EXE setup installation package from existing MSI file format. » Software is fully capable to convert Microsoft Windows installer files into executable installer file format. » Software utility facilitates to save converted .EXE setup files at user specified location on computer system. » Setup builder tool converts MSI files into EXE files without altering original working and features of existing (.msi) setup file package.